If you haven’t watched our awesome hands-on video with the Apple Watch yet, here’s another excellent video quickly comparing Apple’s smartwatch to the Moto 360, which is powered by Android Wear and comes in a traditional round design. The video, made by YouTuber Danny Winget, shows how thick the Moto 360 is compared to the Apple Watch, while also going in-depth with other model configurations which include the 38mm and 42mm Sport models, dark stainless steel link bracelet, Milanese Loop band and leather loop. Recent rumours have claimed Google is close to releasing an Android Wear iOS app to allow iPhone owners to use competing smartwatches. 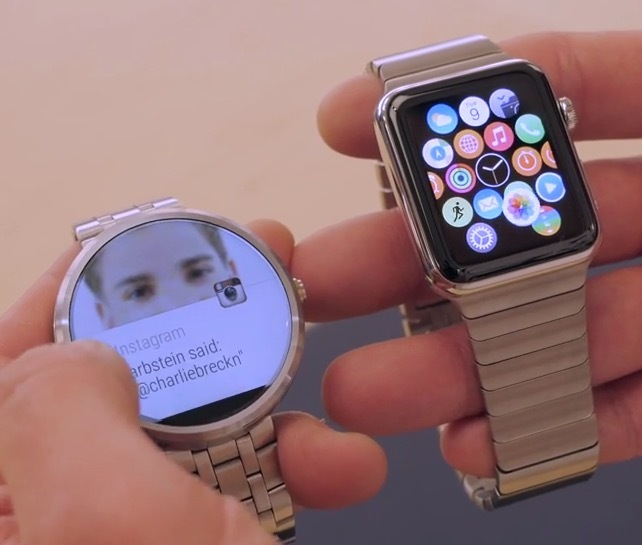 One developer recently created a hack to enable his Moto 360 to show iPhone notifications.